For a car with a strange name the Gumpert is very cool. I decided to use this shot because the back end is one of the best I have seen. Awesome! The car was dreamed up by Roland Gumbert, the ex head of Audi Sport in the 70's, was able to put together a great team to come up with a new kind of sports car. Not sure if that's been done yet but I'm sure that the Apollo with its 691HP, 4.2L V8, and top speed of 220mph, would give it a good go. The Gumpert Apollo is a beautiful conceived and built car that so far has the fastest lap time around the Top Gear track at 1:17.1. 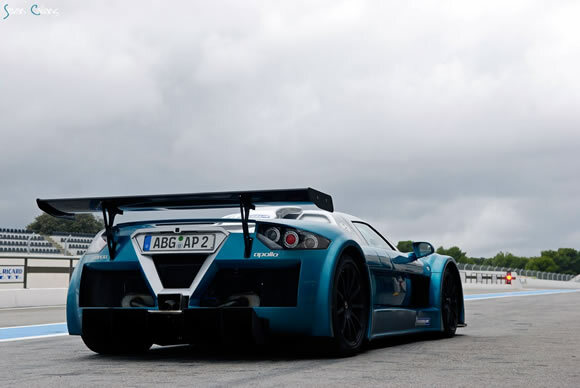 Read about it here and the website has some great information and video's - http://www.gumpert.de/eng/index_html.html.